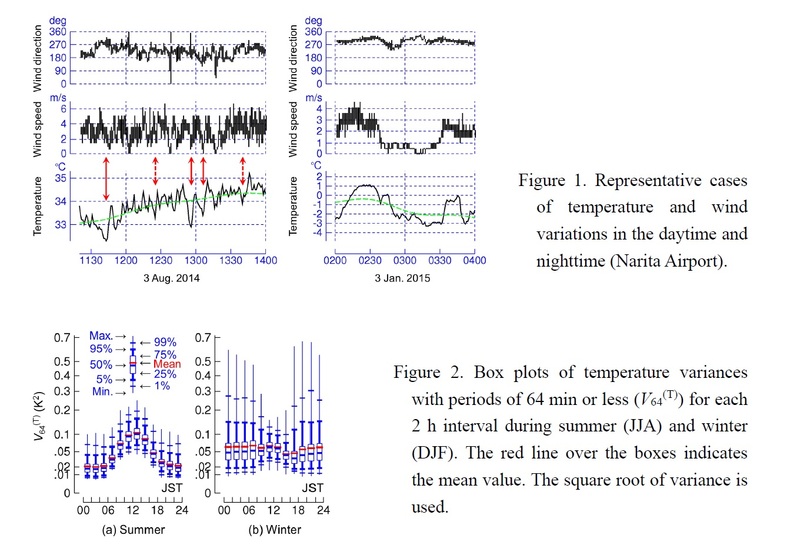 Statistical analyses of temperature variations with periods of 64 min or less were made using 1 min data at 917 stations for four years, as the first step toward acquiring basic knowledge about the climatological features of sub-hourly temperature variations in Japan. Daytime temperature variation is observed throughout the country with larger amplitudes during spring and summer than during autumn and winter, and under high temperature and sunny weather than under low temperature, no sunshine, and precipitation. The variation is likely to correspond to the convective motion in the mixing layer. Nighttime temperature variation shows large scatter among stations, with exceptionally large variations during winter at some stations in northern and eastern Japan. Nighttime temperature variation tends to be in phase with wind speed variation, with longer periods than daytime temperature variation, and is more intense under low temperature and low wind speed than under high temperature, high wind speed, and precipitation. Stations with large winter nighttime temperature variations tend to be located on a col or a slope, where the surface inversion layer is likely to be easily disturbed by any kind of atmospheric motion.